Donald W. Irwin, 88, of Marshalltown, IA, passed away unexpectedly Thursday, October 12, 2017, at his residence. Memorial services will be 11:00 a.m., Tuesday, October 17, 2017, at Anderson Funeral Homes, Marshalltown. Visitation will be 9:30 a.m. until the time of services at the funeral home. Memorials may be to the Animal Rescue League or Iowa River Hospice. Online condolences may be sent to www.andersonfhs.com. Don was born on April 8, 1929, to Phillip and Winnifred (Young) Irwin, in Des Moines, IA. He graduated from Des Moines Roosevelt High School in 1947. Don received a BS in General Engineering from Iowa State University in 1951. He served in the United States Army with the 101st Airborne Unit from 1951 to 1953. Don was united in marriage to Phyllis Elliott on May 5, 1956 in Des Moines, IA. Phyllis passed away in 1984. Don was employed with Fisher Controls in Marshalltown for 41 years. 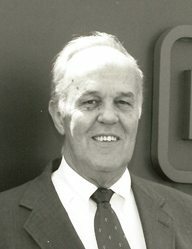 He held many positions at the company before his retirement in 1992. He married Carol Chase Mycka on November 28, 1992. He was an active member and Scout leader for Boy Scouts of America. Don umpired Little League for many years. He was a member of First United Methodist Church, Elmwood Country Club, and the Fisher Heritage Club. Don enjoyed fishing in Canada with his friends, mowing his lawn, as well as spending time with friends and family. He was an avid Iowa State Cyclone fan and loved a good book. Don will be missed by his wife of 25 years, Carol, four children; John (Laurie) Irwin of Des Moines, James (Michele) Irwin of Marshalltown, Jeff (Dawn) Irwin of Marshalltown, Ann (Dale) Stalzer of Haverhill, three step children; Mary Mycka of Des Moines, Beth (Steve) Booth of Fayetteville, AK, Rich (Cindy) Mycka of Fayetteville, Ak four grandchildren; Emily (Mike) Grange, Brett Stalzer, Grace Stalzer, Sam Irwin, six step grandchildren; Kyle Mycka, Corey Mycka, Claire Mycka, Chase (Hope Estes) Nordengren, Jessica (Ryan) Billingsley, Nick Booth, two step great grandchildren; Noah and Luna Mei, a sister, Margery Surbaugh of Des Moines, several nieces and nephews, and numerous friends. He was preceded in death by his first wife, Phyllis and a sister, Martha.